Good value and very friendly welcome from Andreas, Voula and staff. 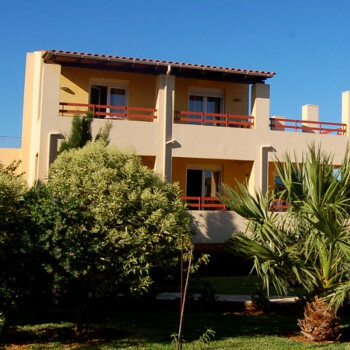 Quiet location above the coast road but within walking distance of the centre of Skala. Good sized rooms, some have better views than others. Rooms cleaned daily and towels/sheets changed twice a week. Rooms have fridges, bath with hand held shower, hair dryer and plenty of storage space. Air conditioning and safe deposit box are available at extra charge. Breakfast is what you would expect from this type of hotel (cereals, fresh fruit salad, juices, bread, meat/cheese, hard boiled eggs,yoghurt, tea/coffee etc) with cooked items available at a charge. Bar is open all day serving a selection of snacks/light meals and a good range of drinks. Stayed at this hotel in June 09. Had a great stay. A familey run hotel, Andreas and Voula very pleasant people any thing you need they are always there to help. They live at the hotel. It is only bed and breakfast it is laid out very well, it is all fresh every day and very tasty. Snacks are served all day long and are really well presented and delicious. The hotel is very clean. It is set at the top of a hill over looking the sea with really pretty gardens surrounding it . There is a bar with a huge selection to choose from. A weekley barbacue with some singing and dancing for entertainment. Would definatly visit this hotel again.